Sy Hersh’s Book on Bin Laden Killing Rejects U.S. Story, Says Saudis Financed Hiding of Qaeda Leader | Democracy Now! Pulitzer Prize-winning investigative journalist in Washington, D.C. His new book is titled The Killing of Osama bin Laden. Next month will mark the fifth anniversary of the raid that led to the death of Osama bin Laden. 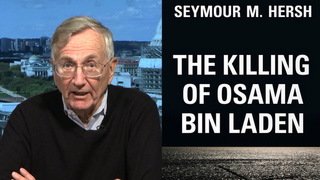 We speak with legendary investigative journalist Seymour Hersh about his new book, “The Killing of Osama bin Laden,” in which he argues the official U.S. account of how bin Laden was found and killed was deceptive, and that Pakistan detained bin Laden in 2006 and kept him prisoner with the backing of Saudi Arabia. He suggests that the U.S. and Pakistan then struck a deal: The U.S. would raid bin Laden’s compound in Abbottabad, but make it look as if Pakistan was unaware. AMY GOODMAN: This is Democracy Now!, democracynow.org, The War and Peace Report. We’re on a 100-city tour marking Democracy Now! 's 20th anniversary, today broadcasting from Santa Fe, from New Mexico's state Capitol building known as the Roundhouse. Our guest for the hour is Pulitzer Prize-winning journalist Seymour Hersh. Next week will mark the fifth anniversary of the assassination of Osama bin Laden. This is President Obama announcing the news of his death five years ago. PRESIDENT BARACK OBAMA: Today, at my direction, the United States launched a targeted operation against that compound in Abbottabad, Pakistan. A small team of Americans carried out the operation with extraordinary courage and capability. No Americans were harmed. They took care to avoid civilian casualties. After a firefight, they killed Osama bin Laden and took custody of his body. AMY GOODMAN: So, that was President Obama speaking in May 2011. Sy Hersh, your new book, titled The Killing of Osama bin Laden, you argue the official account of how bin Laden was found and killed was deceptive. Explain what you think really happened, and talk about the role of Saudi Arabia, Pakistan and, of course, the United States. SEYMOUR HERSH: Well, one of the myths that was created was that we discovered where he was living. Abbottabad is about 50 or 60 miles from the capital of Islamabad. It’s a hilly, higher elevation. And in the summer, it’s a resort place for many of the people who go—many of the people in the government and the military take their vacations there. It’s sort of a Pakistani Martha’s Vineyard, if you will. And anyway, he was there. What I know, as in “know,” is there was a walk-in, that in August of 2010, a Pakistani—I can say right now, he was a colonel in the regular army, not in the ISI, the Pakistani intelligence service, which is a very tough bunch, a separate group. He was an officer who had been passed over for general or whatever, and was—came into our embassy. We have a station chief there who’s quite—quite competent guy named Jonathan Bank. And he went in to him and said, “We’ve had bin Laden for four years.” ISI got him. The Pakistani intelligence service picked him up probably in the Hindu Kush area, in the areas—the mountain area between Pakistan and Afghanistan—where we thought he was. He had been on the run for—let’s see, since late 2011, when we drove him out of Afghanistan into the mountain region. And we finally got him. We looked for him. We thought we had him in '02. There was a firefight that nobody knows about yet, with the SEALs. But anyway, we finally got him because of a walk-in. And you have to know, in the business of the CIA, protecting a walk-in is the most important thing. And so, a walk-in. And so, if you have a bunch of people somewhere in the basement, intelligence officers working on trying to track him through couriers, you may let them think that they did do it, because that's just the way it works in the CIA. You know, they don’t always tell the truth to their people that work for them, when it comes to protecting a source, somebody who walks in. And where I was dumb—you know, this story, I initially wrote much of this in the London Review, oh, about—last year sometime, caused a lot of trouble then. And what I did then, I was so naïve. I thought I had a dog-that-didn’t-bark issue. I thought, I’m going to put the name of Bank in there, high in the story, in the—maybe seven, eight graphs into the story. I’m going to say the walk-in went to Jon Bank. And that’s—I was going to take a chance that Bank would not succumb to pressure. A knew a lot about him. He’s a Harvard grad, very bright guy, very competent. And I just didn’t think he would be trotted out by the CIA to say, “What? What’s Hersh writing about? I don’t know anything about a walk-in.” And I thought the fact that I named him and he said nothing after I wrote the story would be important to the media. But it wasn’t, and nobody paid a bit of attention. And he didn’t do—he didn’t. Instead, they trotted out a retired guy that was plugging a book, named Morell, whose book was—let’s see, I think it was 53 pages of criticism by the Senate Intelligence Committee for something like 78 lies, or maybe it’s 78 pages for 53 lies, that had been published. They just trashed him for the book. And yet, he would go on on television and go after me, nobody asking him about his previous lies in his book. Anyway, big deal. What’s important is, the story we got is that—and I must say, when you do a story like I did, I did have more contact with people in the ISI after I wrote. I learned much more, that was totally—gave me much more flesh on the skimpy bones I guess I had. The first thing the Pakistani high-level—very close to the Saudis. The two generals in charge, General Kayani, who was at the time head of the army, and General Pasha, head of the Pakistani intelligence service, were the two key guys for us. And why so we—Pakistan is very important to us, because they have over a hundred bombs, and it’s one of the big national security issues for us constantly. Where are the bombs? Are they telling us the truth? Are they keeping some out of the count? As somebody once said to me, “Are they hiding a few bombs in the tall grass along the runway somewhere?” And that’s always our worry. AMY GOODMAN: Nuclear bombs, you’re talking about. AMY GOODMAN: You’re talking, Sy, about nuclear bombs, right? Atomic bombs. SEYMOUR HERSH: Yes, go ahead. SEYMOUR HERSH: Oh, I’m sorry. AMY GOODMAN: —in Abbottabad, in Pakistan. SEYMOUR HERSH: The Saudi government was funding—we got him in '06. We learned about him in 2010. We killed him—we murdered him, really, in 2011. And the Saudis, for those years didn't—the Pakistanis did not tell us, because the first person they told that they—when they got him, through the ISI in '06, and put him in Abbottabad, they may—the first people they told were the Saudis. Why? Because the Saudis paid a lot of money to the two generals, and to others, perhaps, to keep it quiet, to keep it from us. They did not want us getting to bin Laden and talking to him. And I can tell you, since I've written that—I learned that from Americans—I’ve learned from ISI people that one of the ways they move money is they send tankers to us. They send—the Saudis would send tankers of oil to the Pakistanis for resale. You can reflag any ship on the ocean. It’s an easy way to move money around. You can change ownership from Pakistani to Pakistani—from Saudi to Pakistani on the high sea. SEYMOUR HERSH: He left our two generals, the two generals in charge of the bombs, hanging. Not a good thing to do. AMY GOODMAN: Seymour Hersh, I want to thank you for being with us. We’ll continue this conversation, post it online at democracynow.org.